Our sample REST resource allows us to ..
More detailed information about the REST resource specification can be found in “Appendix A: REST Resource Specification“, all details about its implementation in “Appendix B: REST Resource Implementation“. This simple class allows us to run our tests with the JUnit framework. We may fine-tune which scenarios to include and where to find it using additional configuration but if we keep this test classes’ package and the scenario file’s path in sync, we don’t need to add anything further than the following two lines to our feature.user.UserManagementTest class. More detailed information about naming conventions can be found in the project’s wiki here, detailed information about adding Cucumber options are available here. This is our Karate configuration file named karate-config.js. We’re specifying the base-url for our tests here (our REST service runs on localhost, port 9000). For more detailed information about the Karate configuration file, please consult the dedicated section in the project’s wiki. We’re now ready to write our scenarios and features down using Karate’s DSL. In our first scenario, we’re going to do some CRUD operations so we’re going to ..
Another interesting feature is the possibility to re-use existing features by loading them into another feature. In the following example there’s a secured resource that can only be accessed with a valid auth-token. To obtain the auth-token, a user needs request a new auth-token using his credentials. To re-use the login procedure, we’re storing it in a feature file named user-login.feature. It’s important to know that we need to pass the user’s identifier and password to the feature and that the last line of the feature file specifies a variable named authToken that we may use then in our original feature file. This is our scenario where a new created user tries to login, we’re verifying that the resource is not accessible without the security-token and then we’re calling the feature above to obtain the auth-token. With this auth-token, we’re able to access the secured service. We may run the tests now using our IDE of choice or using Maven in the command line. I’m running the tests on Bitbucket Pipelines, please feel free to take a look at the full test execution there. 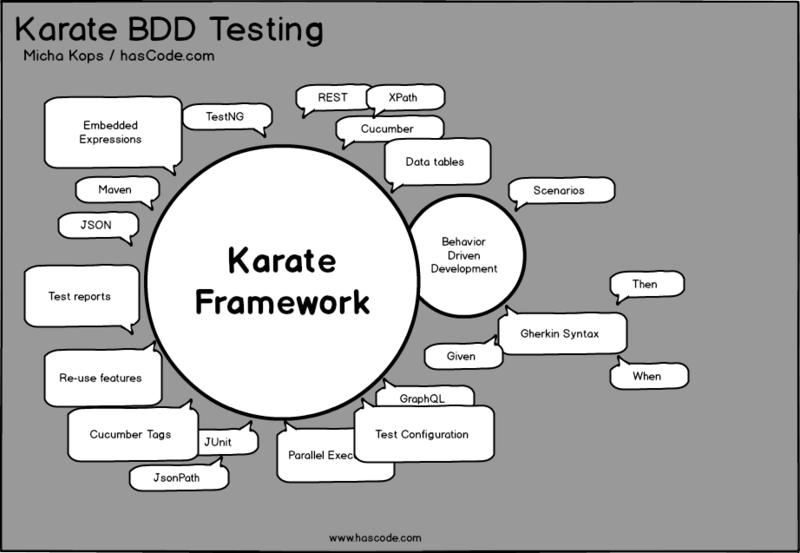 No, the framework’s author, Peter Thomas has written a detailed article about this topic, please feel free to read: “Yes, Karate is not *true* BDD“. [ERROR] 1) No implementation for org.eclipse.aether.RepositorySystem was bound. I have generated a plain-text description of the REST resource using the JAX-RS Analyzer Maven Plugin. If you’re interested in other possibilities to derive documentation from existing JAX-RS web-services in AsciiDoc, Swagger or plain-text format, please feel free to read my tutorial: “Documenting RESTful Webservices in Swagger, AsciiDoc and Plain-Text with Maven and the JAX-RS Analyzer“. This is the implementation of our RESTful web-service under test. Using a tool like Wiremock would have been easier than implementing a real application but I’d like to simulate the usage of Karate with a real application. We need to add multiple dependencies to our project’s pom.xml here. It is important to handle the possible version conflict of jetty-utils here by excluding it from jersey-container-jetty-http – for more information take a look at the troubleshooting section. This is our user entity, serialized via JAX-B, setters, getters, toString etc. ommitted..
For the path “secured” we’re delegating to an sub-resource responsible for secured resources. If you’re interested in such tricks, please feel free to have a look at my article: “JAX-RS Server API Snippets“. This resource allows to obtain the current date in a JSON format but an auth-token is required. 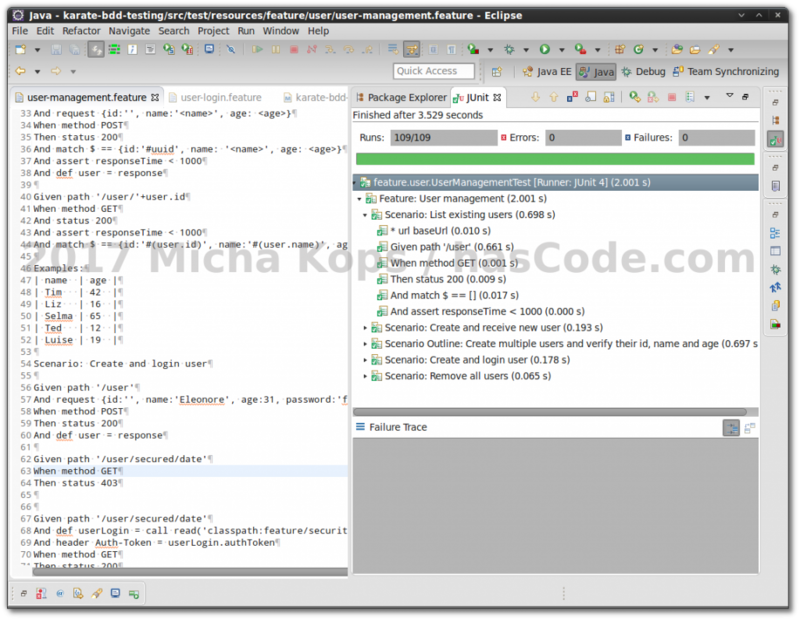 The following code initializes and starts an embedded Jetty server, running on port 9000. Afterwards, our RESTful web-service is available at http://localhost:9000/ and we may obtain its WADL at http://localhost:9000/application.wadl. 2017-07-26: Link to SemaphoreCI article added. This entry was posted on Thursday, April 6th, 2017 at 3:35 pm	and is filed under Java, Web Services, testing. You can follow any responses to this entry through the RSS 2.0 feed. You can skip to the end and leave a response. Pinging is currently not allowed. I am currently doing a test run on karate as part of tool selection process for a new project. As most of my work will revolve around data driven test, how could i work around using external files such as csv/json/xml? Thanks.